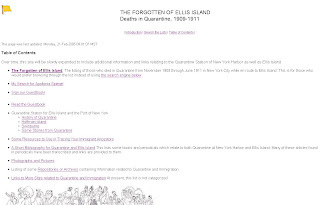 I was surfing the Internet this afternoon when I happened upon this website: The Forgotten of Ellis Island; Deaths in Quarantine, 1909-1911. I learned about two other Islands, Hoffman and Swinburne, that are generally glossed over but may contain vital information for those searching for their family roots. The 418 names of people contained in this searchable database are of those immigrants who were quarantined on arrival to the port at either Hoffman Island Hospital or Swinburne Island Hospital. Hoffman Island was utilized to house those people/children that were afflicted with a contagious disease. The smaller Island of Swinburne was utilized as a housing place to send those suspected of possible disease where they would remain for an allotted time to determine if they had contracted any contagious diseases. Cathy Horn who has developed the website and database states that 85% of the 418 contained in this database are children age 13 years old and under. Being as the large portion of the detainees were children, the mother's and other siblings frequently went to Hoffman Island. Cathy reviewed the registered death certificates of Richmond County (Staten Island), New York from November 1909 to June 1911 and extracted the names of those people that died on Hoffman or Swinburne Island for this database. Cathy has designed the site to be user friendly by providing a site search engine or the ability to browse by the list of names that are included in the database. Thank you to Cathy for the great work. I would suggest if you have immigrant ancestors that came through Ellis Island, you check this database to see if you are missing any family members. If you would like to be redirected to "The Forgotten of Ellis Island" web site, click here.